Lark Writes...on books and life: Hooray for spring break! I have next week off from work and I'm headed to Egypt! That's right, I'm off to the land of pyramids, tombs and temples. I'm dreading the long flight, but really looking forward to all the cool sights I'll get to see from the Sphinx at Giza to the temple of Ramses II at Abu Simbel to Tutankhamen's tomb. I only wish I had more time to spend there. One week is not nearly long enough to see all of Egypt, but that's all the time I've got. I'm not complaining. After all, it's a trip ... and another stamp in my passport. And I finally get to go to Africa where I've never been -- it'll be the fifth continent I've visited; only Australia and Antarctica to go! I hope all of you have fun spring break plans, too! Now for the most important question of all: What book am I taking with me? Lark, that is amazing!! I wish you safe travels and a wonderful spring break in Egypt :) I can't wait for you to share about your trip with us. How exciting for you!! Take care and have fun!! Happy Easter!! Have such a good time! Truly. And I think you are taking the perfect choice. 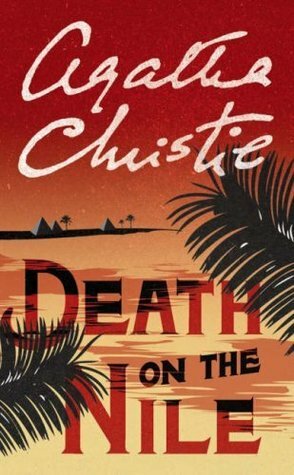 Death on the Nile is one of my favorite Christie books. Enjoy!! That sounds amazing, I am so happy for you!! I hope you have a great trip and I hope you will be able to share some photo's and tales when you are back. And yes, Death on the Nile is a must have book in Egypt!! Wow! Have a wonderful time, Lark! Will you be taking a pic on a camel? Please do! Perfect book to bring with you. Have fun! And tell us all about it when you get back. Have a great week in Egypt. Good idea to take a book along with you set in the country you will be visiting. It makes the trip even more special. Travel safely--and enjoy! Sounds absolutely marvelous--on my bucket list for sure. Can't wait to hear how it goes. How exciting! Have an amazing time. I can't wait to see pictures and hear about all your adventures. I can't remember -- have you read the Amelia Peabody mysteries by Elizabeth Peters? Those are the novels I always think about in connection with Egypt. Wow - how amazing! I hope you are having a fabulous time and can't wait to hear all about your adventures!